Now that the website redesign and my swap piece are finished, I'm inbetween projects and therefore have no purpose. There were all these things I'd planned to do once I finished the site, but now I've forgotten them. 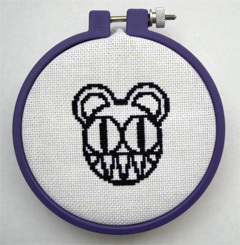 Here's the completed Radiohead bear from last week. I stitched it for the patterns page, so I could have a better picture. The old one was pretty sad. Next week is my birthday, and I'm planning something fun for that. Watch out!